Setting Out: New Grads' Quest For Work Students graduating from college this spring are entering perhaps the toughest, most uncertain job market in generations. In this series, we meet recent grads, who share the frustrations and fears they face as they set out in search of work. October 1, 2010  After sending out nearly 200 applications since his graduation from college this spring, Christopher Self of Rapid City, S.D., finally landed a job. He used to drive a truck for a living. But field experience and relationships helped him move from the driver's seat to an office chair. June 11, 2010  Since his freshman year in college, Duwain Pinder was focused on getting a job on Wall Street. 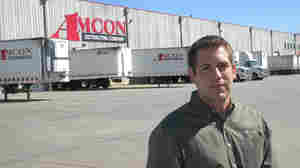 But when the financial crisis shattered that dream, he put all his energy into landing a job in management consulting. His drive helped him land a job as a business analyst for McKinsey & Co.
June 10, 2010  Fresh out of college, Ryan Kam is leaving his home in Waikiki to move to New York City to find work because Hawaii lacks the diversity of jobs that exists on the mainland. Tourism, the dominant island industry, offers few opportunities for upward mobility. June 9, 2010  Christopher Self has spent the past six years working long days and nights as a truck driver. Driving along with financial assistance from the military helped him pay his way through college. But he's still searching for a way to put his degree to good use in the business world. June 8, 2010  Yoelvis Bengochea earned a degree in aviation management so he could become an air traffic controller. But in order to find a job, he has to wait for an older generation of controllers to retire. In the meantime, he's working for his family business cleaning pools. June 4, 2010  As part of Morning Edition's series on new college graduates entering the job market: Ed Koc, of the National Association of Colleges and Employers, talks to Renee Montagne. He researches what degrees are most likely to help grads land a job, and at what salary. June 3, 2010  Full-time musicians typically have to have an entrepreneurial spirit, juggling multiple opportunities to make ends meet. That's the case for Ivan Trevino, a recent graduate of the Eastman School of Music, who plans to teach and perform to start paying back $60,000 in student loans. June 2, 2010  Dustin "Buddy" Cowart is the only member of his family to earn a college degree. He's determined to find a job in the television industry. But with $50,000 in student debt, he has to keep working at a local home improvement store to make ends meet. June 1, 2010  Heather Lefebvre just graduated with top honors from Brandeis University with a degree in English and creative writing. She's leaving school with a diploma in her hand and a mountain of debt. And that has her worried about her academic choices.